Bringing a newborn into a house with dogs? The introduction of a new 'pack member' can be an overwhelming time for your canine companion. Although our pets are very in tune with us and may have already sensed the new feelings in the air, this doesn't mean that they necessarily understand what they mean. Your pet needs time to adjust and there are loads of steps you can take that will help to smooth the transition and make the relationship a happy and safe one. The earlier you start, the easier it will be for everyone. Ensure that your dog is well trained and that you can keep them under control - they should respond to basic obedience commands such as 'sit', 'stay' and 'come'. It is vital that they recognise and understand the word 'no' and that they know to not jump up. Getting your dog used to the new routine they will experience when the baby arrives is also important and is a fantastic way to minimise confusion and feelings of neglect. This could include getting them used to being alone for short periods of time during the day while you are in another room or out of the house. It is a good idea to introduce your dog to your baby’s scent before they arrive home. Bring an item from the hospital, such as a burp cloth, and challenge your dog to sniff from a distance while you hold it, gradually allowing them to come closer. This way you are communicating to them that the item in your hand is yours and then giving permission for the dog to sniff and approach – this helps to start the process of creating boundaries and initiating respect for the baby. There will also be a lot of new objects in the house that will be unfamiliar to your dog – it is important that they get used to these. For example, getting them used to walking well next to a pram and learning which indoor toys belong to the baby and not to them. If you can establish certain boundaries around the house before the baby arrives it will make the transition for your pet a lot easier. If there are parts of the house that will be out of bounds once the baby arrives then put this in place long before you bring your baby home; in doing so, your dog will begin to understand that there are certain places they cannot go without your permission. You do not want your dog associating the baby's arrival with the removal of freedoms that they used to enjoy, as this may anger or upset them. Teaching your dog to stay behind a baby gate or in a crate by encouraging them with treats and praise is a good way to keep them away from the baby, whilst still allowing them to see what is going on and not feel like they are missing out. Introducing your dog to your little one for the first time is a significant step and one that must not be rushed. Taking your dog out on a long walk just before the introduction is a good way to drain their energy and make sure they are in a calm-submissive state. If possible, it is best if the mother greets the dog first as they will be excited to see her after she's been away, while the father brings in the baby calmly afterwards – it is vital that everyone remains as calm as possible. During this first meeting it is important that you do not bring the baby too close. 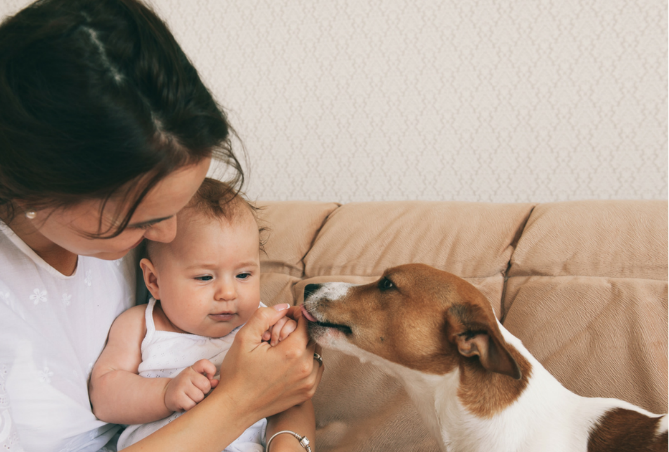 Allow your dog to sniff the baby but keep them at a respectable distance - if you have already introduced them to your baby’s scent, it should be somewhat familiar. Eventually, you can allow them to get closer and closer to the baby, ensuring that they remain calm and quiet. It is important not to shout at your dog if they do get anything wrong or for trying to get your attention, just gently show them the right way to behave and reward them for behaving well – remember, this is a very new experience for them! Welcoming a new member into the family can be a confusing time for your pooch. Therefore, it is important to try to maintain your normal routine, with daily walks and meals at the usual time. Your dog will still need plenty of exercise and interaction to stop them getting bored and frustrated, and to help them feel secure and relaxed about the new addition to the family - a great way to keep them entertained while you are busy with the baby is with some interactive toys. It is important to begin lessons on mutual respect as early as possible. As soon as your child is in the exploratory state, it is the perfect time to start teaching them not to bother and aggravate the dog - by yanking their tail etc. It is vital to supervise all interactions between the baby and the dog to enable a safe and comfortable relationship to form. Make sure that your dog is happy and healthy - check that their worming, vaccinations, and flea and tick treatments are all up to date. Remember – Never ever leave your pet alone with your newborn, however comfortable they may seem with each other. This article provides general recommendations, please seek professional advice for more information on how to deal with your individual situation. If your dog is showing any sign of abnormal or aggressive behaviours, or if you have any concerns, remove your dog or child immediately and consult your vet or vet behaviourist.